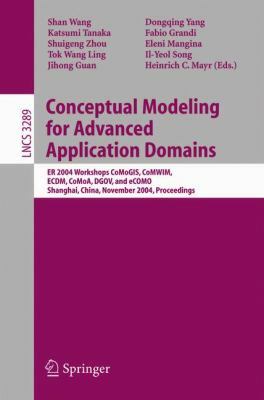 This book constitutes the refereed joint proceedings of six internationl workshops held in conjunction with the 23rd International Conference on Conceptual Modeling, ER 2004, in Shanghai, China in November 2004. The 56 revised full papers presented were carefully reviewed and selected from 163 submissions. The papers are organized in topical sections on geographical conceptual modeling; spatial storage, indexing, and data consistency; spatial representation and spatial services; spatial queries and retrieval, Web information integration; Web information mining; conceptual models for Web information; Web information systems and Webservices; systems evolution support in conceptual modeling; temporal and evolution aspects in Internat-based information systems; schema evolution and versioning in data management; conceptual modeling of agents; agents applications; digital government systems; digital government technologies; e-business systems requirements engineering; and e-business processes and infrastructure.Wang, Shan is the author of 'Conceptual Modeling For Advanced Application Domains Er 2004 Workshops CoMoGis, CoMWIM, ECDM, CoMoA, DGoV, And eCOMO, Shanghai, China, November 8-12, 2004 Proceedings', published 2005 under ISBN 9783540237228 and ISBN 3540237224. Loading marketplace prices 152 copies from $74.33 How does the rental process work?